Earlier this week, the nation was made painfully aware of the reality of Ben Affleck’s massive back tattoo, which he had previously and understandably claimed was fake. But now that we’ve all had a good laugh at this man’s very permanent mistake, it’s time to really get to the bottom of how and why this happened. 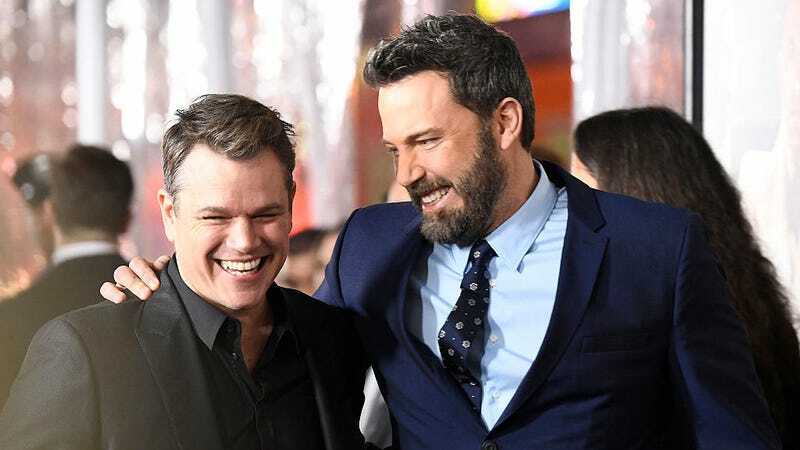 Luckily, Matt Damon—the go-to source for all Ben Affleck-related business—appeared on The Daily Show Wednesday night, where host Trevor Noah forced him to answer for the corporeal crimes of his longtime friend. In recent years, Matt Damon has been known to stick his foot in his mouth during interviews, but, when it comes to the hideous tattoos of his closest colleagues, he can be very diplomatic. “It’s not one man’s job to tell another man what he can do to his back,” Damon said when Noah asked how he could possibly let his friend of 37 years do something so questionable. “I support him in all of his artistic expression,” he added with a laugh he could no longer suppress. Satisfied with the answer, Noah then turned the interview to less-important matters like Damon’s non-profit work and his efforts to get clean water to some of the poorest communities in the world. Now, we’ll just have to hear from the remaining cast members of Good Will Hunting before this whole tattoo matter can officially be settled. Minnie Driver better have a damn good excuse.